Monday morning we got up early (as usual) and after our quiet time with the Lord and breakfast we headed out as the sun was coming up. 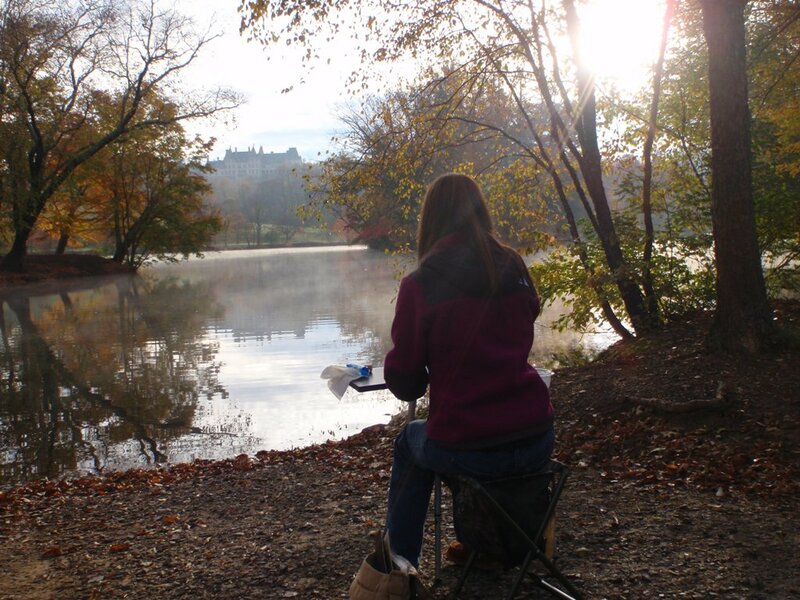 Grady took me to a place he found the day before that he thought would be a great place for me to paint – he was right! 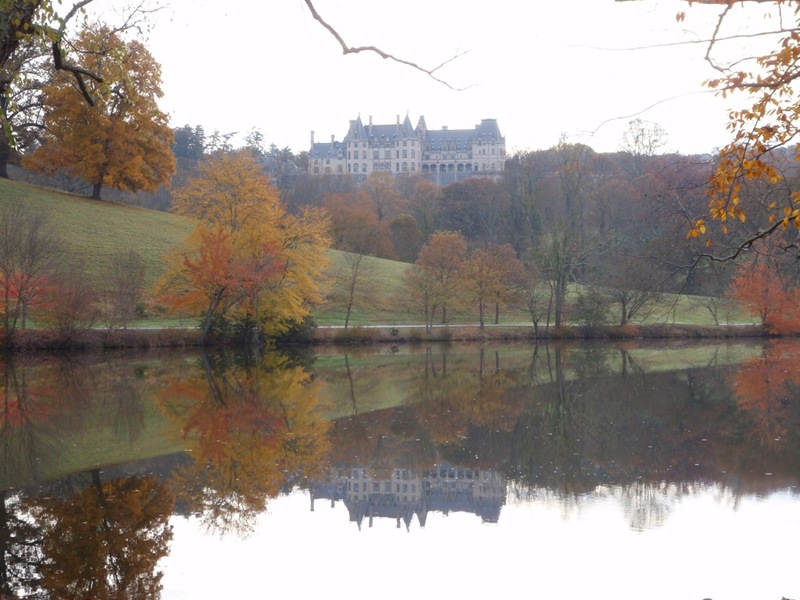 He took me to the Lagoon which is a man-made lake/pond that was purposely positioned so the Biltmore house would reflect in it. It was a beautiful morning but quite chilly so we bundled up. Grady walked around while I painted and took some photos of me and the house and he tried to do a little fishing (even though fishing is prohibited on the property – you didn’t know Grady had a rebellious streak did you?!). I thought it was very kind of him to come with me and just hang out while I painted. He’s so supportive of my painting – he always has his eye out for places to paint or taking pictures of things I may like to paint. You can see in the picture below the GREAT spot Grady picked out for me to paint. I did a quick sketch of the Biltmore – I was planning on getting the reflection in the water but started too big and the reflection didn’t make it into the painting. It was also a very moist morning so I had a little bit of a hard time with my paints because they didn’t want to dry so I was painting wet in wet which is not how I usually paint. You can see my pitiful rendering above. On the opposite page I did a map of the property (click on the picture below to see a close-up). 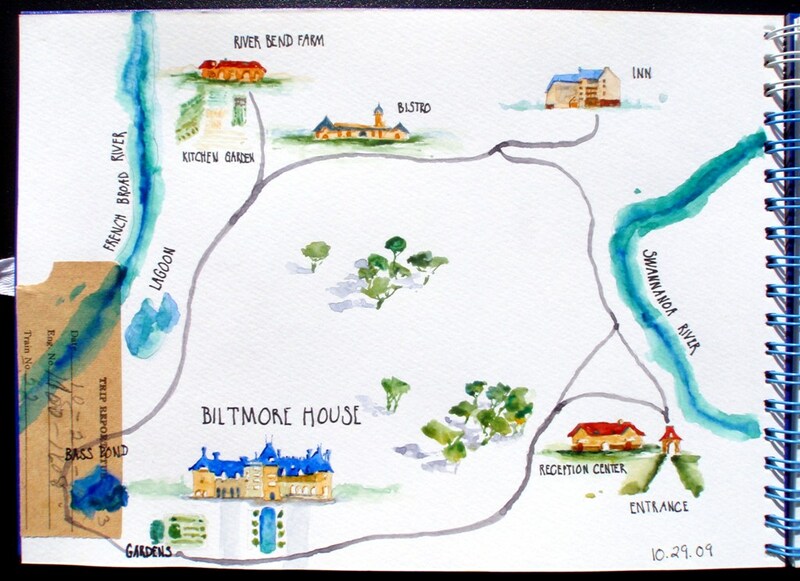 I actually did the map on the car ride home – that’s one of the huge perks of watercolor – you can paint pretty much anywhere! However, I was a little sick by the time we got home because I was looking down at the page for way too long! On the map page you can see more of the old paper wrapped around the page (see previous post for explanation). Hey Sandi, Neat postings. I enjoyed all of it. Looks like you had a really good trip to Biltmore House. I’ve never been there but maybe one day. Still love to look at your paintings. Thank you. Have you settled into your abode of the moment? Did you and Grady buy another house? Hey Marge!!! Yes, we are settled in to our rental for now. We haven’t found another house yet. We’re wondering if the Lord has us in this rental because the government is going to do something radical to affect Grady’s job (he sells insurance). We’re just waiting, praying, and trying to be patient. Great to hear from you!!! Hey, I’m going to be teaching again in January and February if you’re interested. I love wet on wet watercolors, Sandi. I think your Biltmore mansion turned out so lovely, truly. I think I have to work more in my sketchbook. Yep, that is what I must do. You are an inspiration! Thank you! 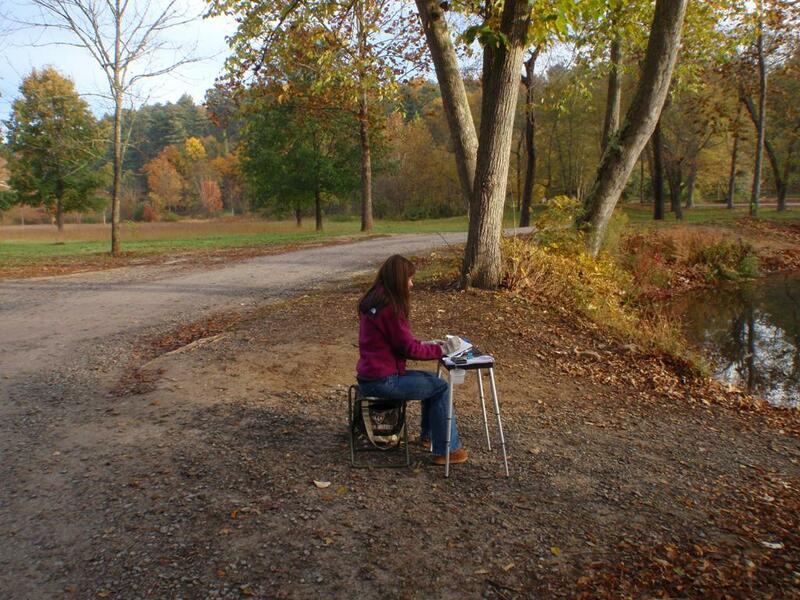 Yes, get that sketchbook out and use it!!! I’m so glad I can be an inspiration to you!